Very pleased with both of our tour guide. Both were very nice, accomodating and knowledgeable. The reason for a 4 star rate is that after the 1st part of our tour - there was 1.5 hr break and the instructions that was given to us on where to meet up was not clear. We almost missed the 2nd part if not for the other guy that in our group that we run into-also lost. We really like this tour. Our morning tour guide, Christine, is terrific with giving relevant info in interesting and fun ways. She is a native English speaker and was super easy to understand. She also managed the pace very well to make sure we get to see all planned sites .Our afternoon tour guide, Irene, a native of Rome. She gave us a fantastic tour of the Colosium, the Forum and other ancient Rome sites. Then she led us downtown to see the modern Rome sites and fountains. Irene is the best guide one can hope for .She makes sure everyone is cared for and are having a good time. We got all the info and fun facts we wanted at each site and more. Her energy level is incredible even at the end of a really hot and humid day .Thank you for a wonderful day in Rome .We went out on our own the next day and complete our Roman holidays in style! Victor was outstaning!!!! Really super!!!! My four star rating is a combination of reviews for both tours within the full-day tour. The morning tour was amazing, our tour guide had great energy, humor and was very knowledgeable about Rome and each of the sites we visited. I felt excited and energized when I was touring with her. The afternoon tour Vatican was an average rating. The tour guide seemed like she hated her job and was complaining the entire time. Although there were long lines/queues, a tour guide shouldn't make it worse by complaining herself. And, she mentioned how the Vatican was nothing extraordinary to her since she works there and sees it everyday. Probably not the best thing to say to people who travel across the world to see this site. Afternoon tour, amazing sites but just okay tour guide. Chiara did the first half of the day with the Coloseum, Forum and other attractions. Christina did the Vatican. Both guides were knowledgeable, worked at perfect pace and made our group feel intimate with the history. I would recommend this tour to get a rich and deep but timely review of the city. We had a long list of things we wanted to see and do when in Rome. This tour allowed us to tick off more about half of that list in the first day of our 3-day visit to this wonderful city. Our tour guide in the morning was Chiara and she was absolutely fantastic. The first two stops were the Colosseum and then the Foro Romano and we family of 4 shared our guide with a lady from the US, so it was only 5 of us. The tour was really personal and we learned so much. The rest of the morning we had Chiara to ourselves. I don't remember the guide's name in the afternoon, but this was less personal by its nature, because we were in a larger group with equipped with intercoms. That was fine, but there are a lot of galleries in the Vatican and the tour can only give you a relatively brief overview. 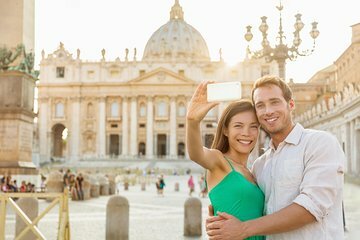 Still, you get a wealth of information and plenty of time to enjoy the Sistine Chapel and St Peter's Basilica on your own. To be fair, the tours are all pricey, but if you were to buy all the tickets separately and do the research and then queue up for all these places, you would probably need two days rather than one and it's probably not that much cheaper anyway. We thoroughly enjoyed it, but we ended up walking nearly 26k steps that day each or 19 kilometres if you prefer. If you are happy to do a lot of walking, which we were, I can highly recommend this tour for you. Fantastic tour! The best of Rome in one day. If you have limited time in the city, I HIGHLY recommend this tour. Tour guides were very knowledgeable, told interesting tours, and were funny and enjoyable to listen to. Brilliant tour, really enjoyed the day. Julian was very knowledgeable and really passionate about the history of Rome. He was very attentive and took the time to explain any questions asked. He did not just talk about the history but explained some of the myths and ensured we knew what was fact and truth. Irene was our guide for the afternoon and she took us around the Vatican and the sistine chapel. She defiantely knew her stuff and had great humour.